Originally reported by fisherman from Isla Holbox, the shallow water feeding area quickly became a remote tourist destination. A second congregation has been found in the deeper waters of the Gulf about 20 to 30 miles out from Isla Mujeres just northeast of Cancun. Locally called the “Afuera” (outside), this grouping of whale sharks appears to gather to feed on huge patches of fish eggs from spawning Little Tunny/ Bonito (small Atlantic Tuna). In fact, the surface water of the ocean can become almost milky with fish eggs and the whale sharks converge on these nutrient-rich patches. 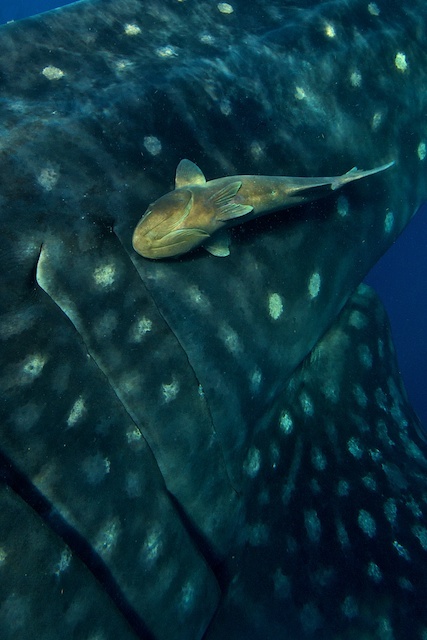 With the ability to filter 1,500 gallons an hour, the whale sharks gorge themselves on the fish eggs. Nikon D2xs, Tokina 10-17mm at 10mm, F8, 1/160th. 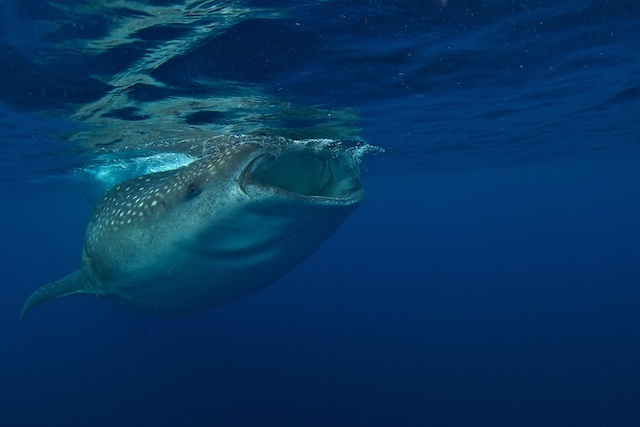 From May to September, whale sharks supply a significant tourist attraction for Mexico. 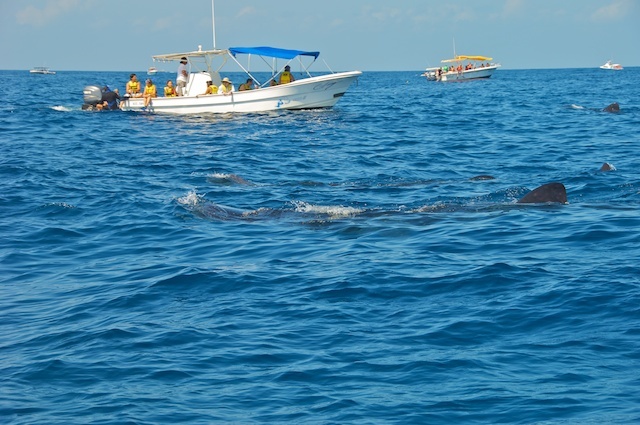 Boats from Playa del Carmen, Cancun, and Isla Mujeres travel the 1-3 hour distance on a daily basis so that tourists can snorkel with these animals. In order to protect the sharks, the Mexican government in coordination with local biologists, has set up specific viewing regulations. This year the season runs from June 1 to September 15. Any tours outside these dates are illegal. Boats have to have guides with regulated numbers of snorkelers per boat. Flotation devices have to be worn; a wet suit is considered a flotation device. No scuba is allowed. 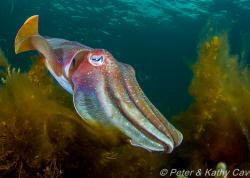 Underwater photography without flash is permitted. Obviously touching the animals is prohibited. The rules are pretty well adhered to as a license is a livelihood for a boat captain and the areas are patrolled by the regulating bodies. However, you cannot walk five feet on the island without getting accosted by a boat tour hawker, and there were days on the water where we counted over forty other boats. Given the density of sharks that we saw, I would say that it would be pretty hard to go out and not see any animals. However the trips are weather dependent and all boats can be grounded due to high seas. This actually occurred one of our days as we arrived on the back end of Tropical storm Don. Calm waters here do not mean calm seas 20 miles out. Cancun is on the horizon. As far as underwater photography is concerned, this is a “light” trip. First of all you don’t need full scuba gear. Fins, mask, snorkel and wet suit (with hood, see below) are all you need pack. Underwater, you will only be shooting wide-angle, and the wider the better. Do not take strobes, arms, spotting lights etc, as you can’t use them. For SLR shooters, just a dome port and one or two lenses are all that's needed. All my images were taken with a Nikon D2xs (cropped sensor) and a Tokina 10-17mm fisheye lens or Nikon 10-24mm AF-S DX lens. Don’t forget appropriate extension rings and diopter filters for your dome port. For compact shooters a wide-angle port would be a must. For instance the Canon G11 with the dry mount wide-angle port should work quite well. You will need to disable the internal flash. All images are with available (natural) light and this takes some trial and error. Bobbing on the surface with the shark moving below you makes using the viewfinder or live view challenging. Free diving can help eliminate some motion (you will need to add weight to compensate for the wet suit buoyancy). Sunny days allowed for shutter speeds in the 1/125th to 1/200th range while keeping the f-stop (aperture) around F8 to F13 (shooting with an ISO of 100-200). However there can be a lot of backscatter on bright days, especially with a lot of eggs in the water. Keep the sun to your back. Easier said than done when whale sharks are coming at you from all angles. Slightly overcast days seem to be the best. The water is darker and the colors are amazing. One particularly dark day was a challenge for my camera. Wide-open f-stops, slow shutter speeds, and pushed ISOs just didn’t produce acceptable images. Some of the newer high ISO sensors would help in this situation. Nonetheless, getting close to the animal is the key. Silhouette shots are also possible with free diving. Tokina 10-17mm at 10mm, F8, 1/200th. 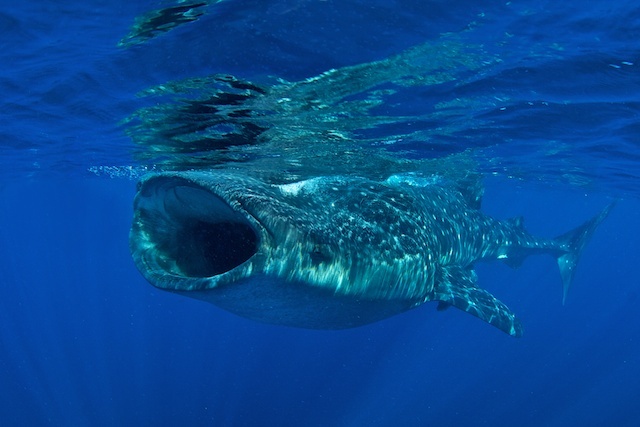 Close-up of a whale shark's massive mouth. Nikon AF-S 10-24mm lens at 10mm, F8, 1/125th. Whale sharks are said to travel at about 3 mph. It seems like these 30 (+) foot animals are traveling 20 mph. If you spend your time chasing, you will end up exhausted. It is best to let them come to you. There are so many in the water that you can be concentrating on one animal and get bumped from behind by another. As they swim right at you some will veer off but others will just keep coming! Towards the afternoon the animals seem to slow down as they are so full and underwater photography is easier. When it is cloudy or the seas are rough the sharks tend to stay deeper. Remora on the back of a passing whale shark. Nikon AF-S 10-24mm DX at 24mm, F8, 1/125th. If you are right in front of the shark they may not see you, with eyes on the side of their head. Like all sharks they do sense electrical current but they still may move ahead. The large animals have mouths four feet across. Sharks propel themselves using their entire body. This puts a lot of force in the tail. WATCH OUT FOR THE TAIL. It may look slow but it can deliver a blow. You will want a good lanyard for your camera. The animals seem to pass in waves. Our boat captain was very good about moving us around to keep in the peek action. However, floating around with no land in sight, there was always something happening. 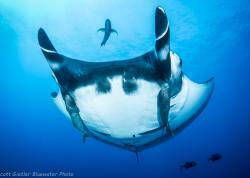 We saw mantas, sailfish, cownose rays, mobula rays in large schools and Bonito tuna. So between whale shark runs, keep your eyes down. 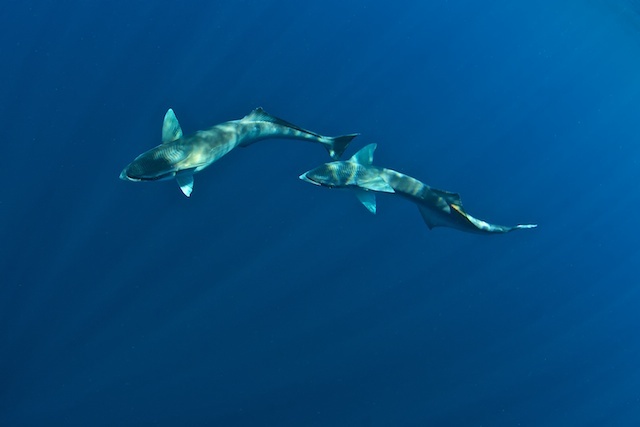 A pair of lone remoras passing below in between waves of whale sharks. Tokina 10-17mm at 10mm, F9, 1/160th. The tourist boats are not well suited for photography. They are crowded, have limited time in the water and you are surrounded by one hundred pairs of legs dangling in your line of site. I wanted a trip dedicated to photographing whale sharks. Isla Mujeres has the shortest travel distance out to the sharks, not an insignificant consideration in 3-6 foot seas. Traveling to the island is not difficult. Many US cities have direct flights to Cancun or you fly thru Miami. 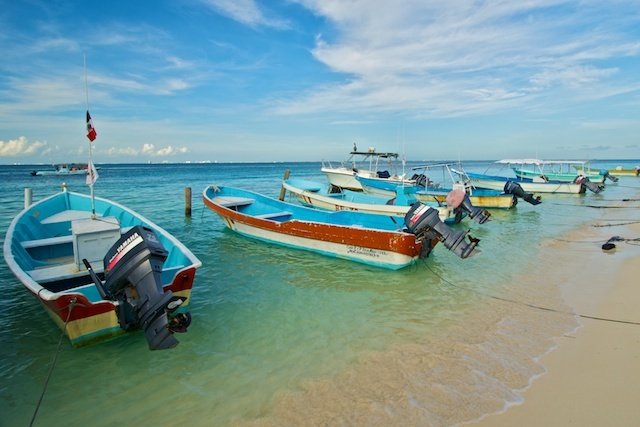 A thirty-minute cab ride gets you to the ferry; the crossing to Isla Mujeres is a comfortable 20-minute air-conditioned trip. 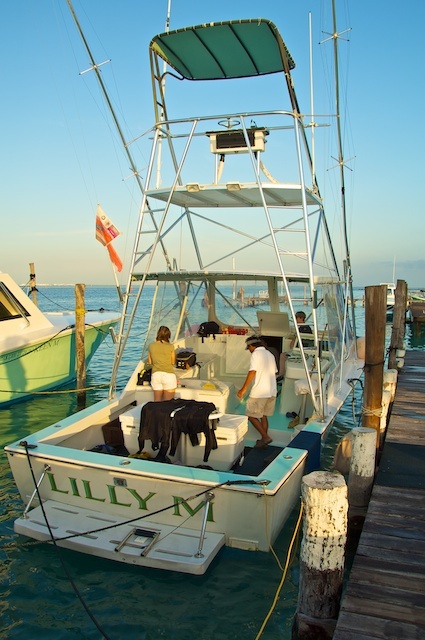 My research of Isla Mujeres found only one boat company that caters to photographing whale sharks. 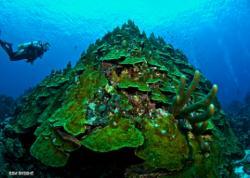 Pro underwater photographers who charter one-week trips occupy the company most of the season. The owner did say that he has some open spaces that can be rented by independent groups. I signed up with Mauricio Handler who I have traveled with before. Once you hit the island, everything else is pretty much taken care of. The boat captain owns the hotel. Breakfast and lunch/drinks (on the boat) are included as well as a very knowledgeable and helpful crew. We had ten photographers and spent four days bobbing on the high seas photographing to our hearts content. The boat left before the snorkel trips and stayed for a while after they went to shore. If it got crowded in the water the captain would pick up our group and find a more isolated spot. The 36 foot boat made the trip out and back in “relative” comfort. The sun can be brutal, especially reflecting off the water and frying your face. You may be in the water for four hours a day. Sunscreen just doesn’t cut it. Hair challenged men can get the scalp cooked. The best solution seems to be a full hood. It protects your scalp, ears and most of your face. Seasickness can ruin your trip. Unless you are Captain Ahab, bring something that works for you. There is as much motion in the water as on the boat. I used Scopolamine patches for the whole trip and my spares were eagerly passed around to people who “never” got seasick. 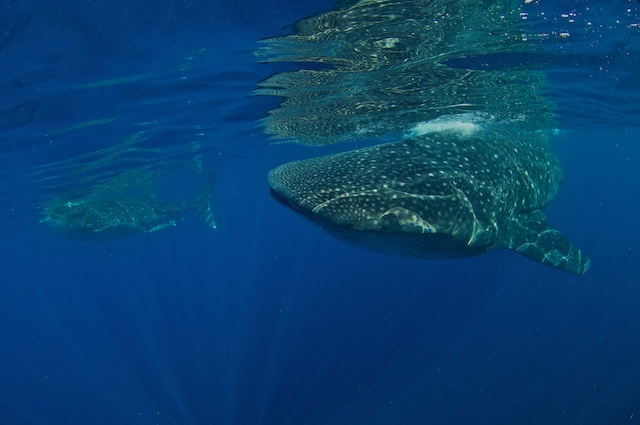 When the usually solitary whale sharks aggregate in one spot, by the hundreds, it is an amazing natural event. To be able to witness the sight and photograph these animals is an equally amazing experience. Below are some further links to help with planning a photographic trip to Isla Mujeres and the Afuera. 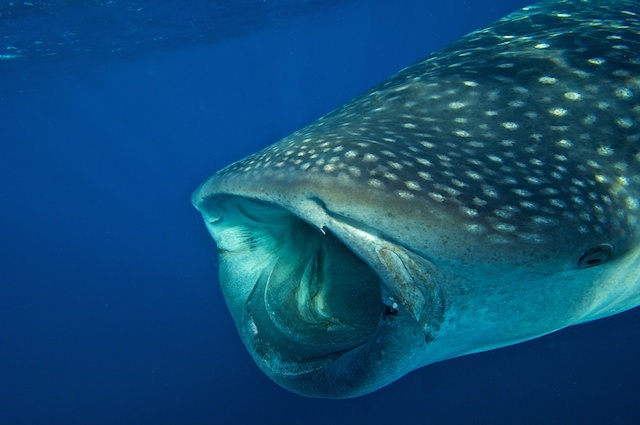 Join Underwater Photography Guide in 2012 as we dive with whale sharks! Submitted by Anonymous on Sat, 2012-04-07 16:02. 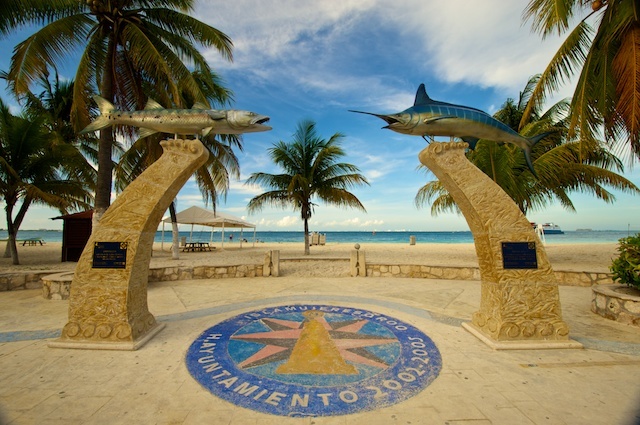 I'll be diving the Yucatan penn July and Aug 2012, home base either Isla Mujeres or Holbox. I'm interested in finding a few dedicated UW photographers to charter a boat and photo whale sharks. Submitted by Anonymous on Sat, 2012-04-07 15:56. I'm interested in snorkeling with a small group of serious photographers to photo whale sharks in either Hol Box or Isla Mujeres MX. July-Aug 2012. I've been there before...spectacular! Some days there were as many as 20. Submitted by catrin pichler on Mon, 2011-10-10 13:12.
thanks for your wonderful pictures! I was there end of August too - but I had flooded my camera some time before at Coiba! Submitted by Anonymous on Mon, 2011-08-29 09:38. Can you tell me how to contact the boat company you used or how to contact pro underwater photographers. Petteri Viljakainen (Hopefully at Isla Mujertes next july). Submitted by smb2 on Tue, 2011-08-30 09:39. The Keen M International link is above. That is the boat operator. I know of three Pro tours. I went with Mauricio Handler http://www.handlerphoto.com/ who runs a great program. I have done several land and UW trips with Mauricio and recommend his expeditions highly. This is a great trip. 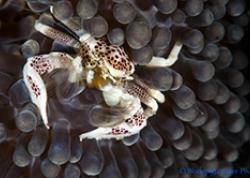 Although confined to snorkeling there is lots to see and photograph. Submitted by Anonymous on Thu, 2011-09-01 11:35. Booked the trip for next year. Thank you for the information. Submitted by Anonymous on Fri, 2011-09-02 12:09. Let me know if you have any further questions before your trip. Might see you there but a little to far in advance for me to plan, at the moment.